Emilio Baselice is General Manager of Intesa, an IBM Company. After graduating in Economics from the ‘Cattolica del Sacro Cuore’ University in Milan, he began his professional career at IBM in 1998, where he handles clients in the world of utilities and it contributes to the project for the introduction and dissemination of remote electronic meters. 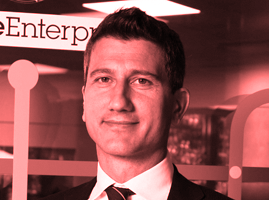 In 2007 he decided to take on new professional challenges, landing first in INET and then in BT Italy, where he held the position of Sales Manager and supports the bid transformation aimed to evolve the company from telco providers to outsourcers. In 2014 he returned to IBM and assumes the role of Sales Leaders in the Services. From February 2015 Emilio Baselice holds the position of General Manager of Intesa, with a mission to develop and expand the digital market in which the company operates.